In 2009, the New Jersey Department of Transportation adopted a Complete Streets policy which defined a complete street as one designed to provide safe access for all users by implementing a comprehensive integrated multi-modal network of transportation options. The benefits include increased safety for all users, connections between origins and destinations, and the promotion of healthier and more livable communities. Since the policy’s adoption, Complete Streets has built momentum throughout the state. As of December 2017, 8 counties and 139 municipalities have followed the lead and adopted their own local Complete Streets policy. The Bicycle and Pedestrian Resource Center, part of the Alan M. Voorhees Transportation Center at Rutgers University, has developed a series of case studies intended to highlight Complete Streets leaders in New Jersey. The first round of case studies was published in 2016 and focused on Passaic County, the Borough of Somerville, and Cherry Hill Township and can be found on the BPRC website (njbikeped.org). 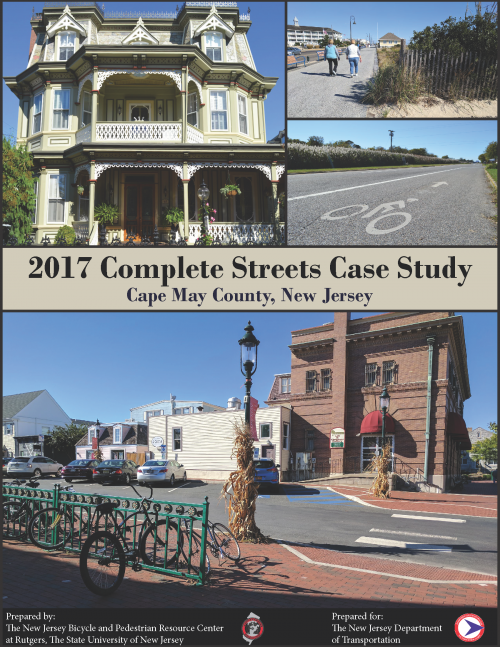 The purpose of this report, funded by the New Jersey Department of Transportation, is to highlight Cape May County’s Complete Streets achievements. The report is based on findings provided in interviews with Leslie Gimeno, Cape May County Planning Director, and Dale Foster, Cape May County Engineer. Cape May County utilizes a dedicated funding source to support and promote Complete Streets initiatives throughout the county. The Open Space Program, expanded in 2013 to included recreation projects, provides an incentive for the county’s 16 municipalities to incorporate Complete Streets into their infrastructure improvement plans. In addition to the dedicated funding source, the county’s economy provides a unique opportunity for Complete Streets and active transportation to flourish. The county’s tourism economy brings heavy pedestrian and bicycle traffic in the summer months, which has ensured that alternative modes of transportation have been an important consideration throughout the county. The report begins with a summary of key findings followed by background information including historical, demographic and land use data collected from county and Census documents. This information is essential in understanding the context of Complete Streets in Cape May County. The report then explores the implementation of Complete Streets in Cape May County, including the county’s innovative funding program. Successes and challenges are then highlighted for the benefit of other communities looking to implement Complete Streets and a number of next steps provide readers with insight into the county’s future Complete Street efforts. The research team hopes that this report will serve as a valuable tool for engineers, planners, elected officials, and advocates who want to move forward with Complete Streets in their communities.